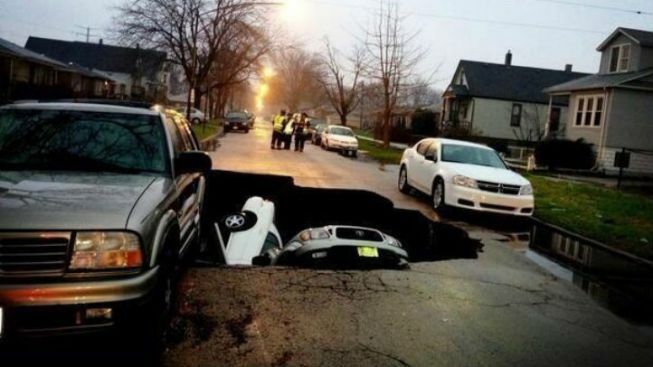 One person was hospitalized after three vehicles were swallowed Thursday morning by a large sinkhole on Chicago's South Side, officials said. A circa-1915 city water main broke under more than five inches of heavy rain across the area, causing the sinkhole to rip open around 5:20 a.m. in the South Deering neighborhood, Chicago Police spokesman Mike Sullivan said. Police said the injured person was driving in the 9600 block of South Houston Avenue when the road caved. He was taken to Northwestern Memorial Hospital with non-life threatening injuries. Two cars were inside the hole when fire crews arrived. A third car, which was parked, slid into the hole after they arrived. Flooding has cause multiple road closures, including two major expressways, throughout the area. About 300 flights were canceled at O'Hare International Airport and dozens of schools were closed. The Illinois Department of Transportation urged commuters who take expressways into work to consider staying home. Two more inches of rain is expected throughout the day as area rivers continue to swell and neighborhoods flood.